Before we moved out of London we were lucky enough to live in a very spacious, light and airy one bedroom flat in East London. It was unfurnished, and well, we had nothing. We've always lived in furnished places, and not necessarily nice furnished places either so we were looking forward to putting our own stamp on things. However, like most people, we can't afford to go out and purchase our dream furniture all in one go, so when a friend offered to sell us her old Ikea Klippan sofa for £40, we were very thankful. However, our friend has young kids so by the time this sofa reached us it had had its fair share of mess and dirt, and being cream, it was grubby to say the least! We didn't mind though, cover it with a few quilts and you're good to go. After a few months, I wondered whether dying the sofa would be a viable option. After a quick google, I found that other people had done the same thing here and here, but I couldn't find much UK based advice, except for this useful thread. To be honest, I still embarked on my experiment with a fair amount of trepidation! It seemed like everyone was asking the same questions and some people were experiencing great success whilst others were failing miserably. And of course there's so many variables! Is my washing machine big enough? How much does my fabric really weigh? What colour is the safest option? Will the stains dye the same as the clean(ish) bits? At the end of the day, you just have to jump right in. I will say, you probably won't get absolutely perfect results, but you'll be able to brighten up your home and save a few quid rather than forking out on a new cover (which is almost as much as a new sofa!). I was a bit scared of filling my bath with dye and the washing machine kind seemed like the easier option at the time. I chose Antique Grey because firstly, if I were buying a sofa new, I would choose a grey one, and secondly, I thought a darker colour would be more likely to cover up the grubbiness. According to the Ikea website, my sofa cover weighed 2.2kg. 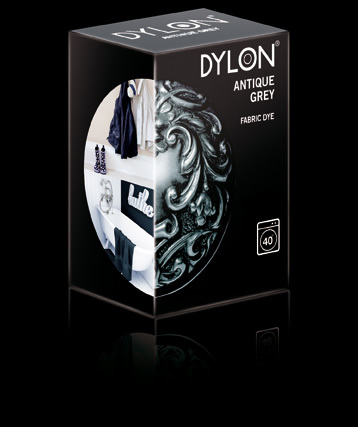 For 2kg of fabric, Dylon recommends four boxes of dye. As I was particularly nervous about it coming out patchy, I went for five to be on the safe side. You only need 500g of salt, however much dye you're using. Don't buy over a kg of salt because you think you need 500g per box of dye (like I did!). I didn't bother with this because my sofa was cream, but if you're dying fabric that's already a darker colour, you'll need this to first dye it to a more neutral shade. Normal colour mixing rules apply, so if you have red fabric and you dye it blue, you'll end up with purple. 1. 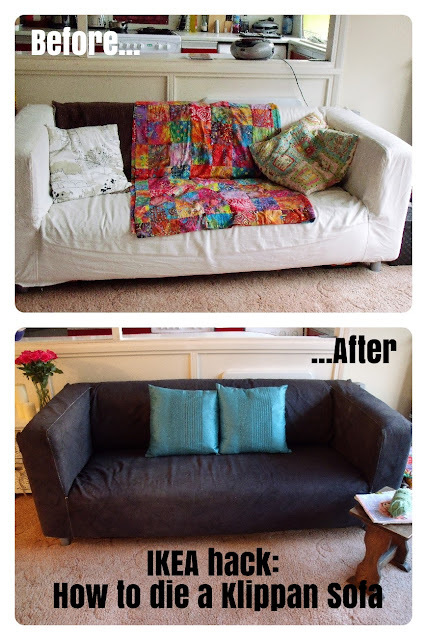 Wash your sofa cover first to get rid of any existing dirt. I put mine on a 60 degree wash in the hope that it would get as much out as possible! 2. Take it out the machine. I would recommend you give it a good shake out. I didn't do this and the creases ended up being dyed into the cover! 3. Empty the dye (it's powder) into the bottom of the drum and layer the salt over the top. Put the cover back in the machine (still damp) and set the machine to a 40 degree cycle. Don't add any detergent and make sure the machine isn't set to an economy cycle. 4. Once finished, add detergent to the machine and wash it again. 5. Hang it up to dry. I was a bit scared because it came out looking really black when I wanted grey, but it wasn't patchy so I couldn't complain. However, once it dried it was of course a shade lighter. Because it's quite heavy fabric it took a good three days to totally dry. 6. Give it a good iron. This is hard work because it's so big and heavy, but once you've got the majority of it done, put it on the sofa, tuck it all in and then iron it on. 7. Buy some nice colourful cushions and stand back to admire your handiwork! Now, don't get me wrong, if you look closely the results aren't perfect. As I said, the creases are dyed in and there are some tiny bits which are either a bit greenish or tiny smudges of cream, luckily they're not in obvious places. Overall though, I'm pleased with the results. It looks much better than it did and it fits in better with the colour scheme I'm aiming for. I think that's pretty good considering the sofa is included in that budget! That's fab!!!! I don't need to dye anything but I still enjoyed reading it!